John O'Shea was born on 30 April 1981 in Waterford in the Republic of Ireland. Although he had been identified by Manchester United as promising talent at an early age O'Shea stayed in Ireland to finish his academic education. He signed his first professional football contract in 1998 and moved across to the Old Trafford outfit on a full time basis. John O'Shea made his Manchester United debut on 13 October 1999 in the third round of the League Cup. United were visitors to Villa Park and fielded a largely second string team. It was no surprise that Aston Villa won the match 3-0. O'Shea spent most of the next two season playing in the United reserves. In order to gain regular first team football he went out on loan to Bournemouth and Royal Antwerp in Belgium. Following on from these loan periods he broke into the United first team in the 2020/03 season. The following season he appeared regularly in place of central defender Rio Ferdinand who was suspended for missing a drugs test. United reached the FA Cup final that season with John O'Shea playing at fullback. O'Shea picked up a winners medal as United beat London club Milwall 3-0. This was not his first United honour as he had made 32 appearances in the Premier League and thereby collected a winners medal for the 2002/03 season. O'Shea is a hugely versatile player and has played right across the defence, in midfield, and as an auxiliary striker. On one occasion, 4 February 2007, John O'Shea replaced the injured Edwin van der Sar in goal and notably he denied his Irish team mate, Robbie Keane, a good scoring opportunity. John O'Shea scored his first goal for Manchester United on 27 August 2003 at Old Trafford in a 1-0 victory over Wolves in the Premier League. On 3 March 2007 O'Shea scored a very late winning goal against Liverpool FC at Anfield. This was a vital 0-1 win for United as the team went on to win the Premier League title that season. 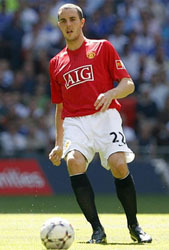 O'Shea enjoyed a very successful career with Manchester United although he has experienced some disappointments. Notably the 2-0 loss to Barcelona in the 2009 Champions League final and more recently when he missed 31 consecutive matches as a consequence of an injury that he picked up in November 2009. It was during the infamous World Cup play-off match for Ireland against France in Paris when Thierry Henry handled the ball twice to set up Gallas for a goal. John O'Shea ended his Manchester United career when he signed for fellow Premier League team Sunderland on 7th July 2011. John O'Shea made his international debut for the Republic of Ireland on 15 August 2001 as a substitute in a friendly match against Croatia. The match ended in a 2-2 draw. He scored his first international goal on 19 August 2003 in another friendly match at Lansdowne Road (now Aviva Stadium) against Australia. John O'Shea remained an integral part of the Irish national team under Giovanni Trapattoni and Martin O'Neill.